These are from our walk through a nearby meadow today. While I’m talking about oak trees, here’s the solution to another mystery. 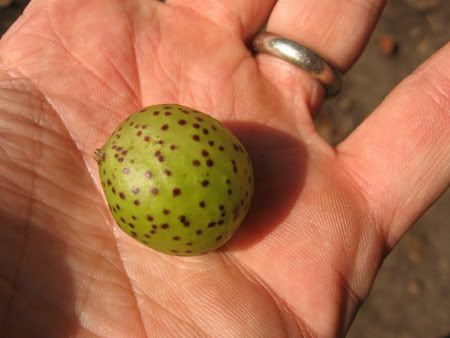 We often find little brown-spotted green spheres in our yard or neighborhood. Not knowing what they are, I’ve called them pods and Amy has come to consider them an exciting find. As it turns out, “pod” is pretty appropriate because they’re actually galls formed by a species of wasp and even have wasp larvae in them. Click on either the picture above or the one below (from two different sites) for more info. Apparently this was a rainy year at Camp Huckins. Rumor has it that one two-week session of the regular camp for girls rained all the time except the last two days. Imagine three hundred girls, cooped up fourteen to a cabin, all disappointed because what was supposed to be the highlight of their summer was – almost literally – a washout. That must have been pretty miserable. Fortunately, the weather was excellent for family camp, with just a bit of rain one morning. It had rained a bit just before, though, and that combined with the rain earlier in the summer resulted in a bumper crop of mushrooms. Here are some of what I saw or think I saw. Sickener: plenty everywhere, especially in the section including our cabin. Destroying Angel: several around our cabin, a few elsewhere. Old Man of the Woods: a couple. Orange Waxy Cap: at least one. King Bolete: one, or at least something very much like one, near the craft cabin. Here’s a (slightly unusual) example of what’s missing from that list. There were a lot of these all around camp, most 5-6″ across. I speculated more than once that we could have a feast if they were edible . . . not that I’d want to risk eating any mushroom unless I was absolutely certain of its identity. Since coming home, I’ve tentatively identified these as lactarius deceptivus, and it turns out that whether they’re edible or not is a matter of some debate. 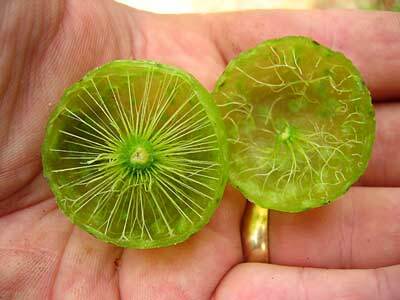 The best explanation I’ve seen is about L.piperatus, but it does mention L.deceptivus as well. I’m often amused by how mushroom descriptions mention taste even for known-toxic species, and surprised by how often there seems to be uncertainty about whether some mushroom found in North America is really the same as the one found in Europe or not. I think I’d be interested in trying a small bit of one of these, prepared the way the article describes, if I ever get a chance. Of course, the picture above is of a very unusual two-tiered specimen, or maybe one growing on top of another. It’s the only one we saw, and I didn’t have my camera with me the first time so I had to come back the next day. I’m very pleased with the find. Nothing earth-shattering here, just some generally nice pictures. A goat standing on an upturned box so she could look over the side of the stall. A greenhouse full of onions. They had a tepee-like structure like this last year, too. I’m fond of both morning glories and nasturtiums (nasturtia?) so I just had to take a picture. Just a plain old garden-variety cabbage moth. There are thousands of better pictures out there, but I wanted to see what the new camera could do and I think it worked out OK. I’ve had little luck with the macro feature in general, with every picture taken at less than about 1′ being blurry. Maybe there’s some special trick to getting good focus in macro mode, or maybe it’s just an otherwise fine camera’s Achilles Heel. A goat family portrait. Amy and some other kid I don’t know in the tack room. These are mostly from the petting farm at Domino Farms in Ann Arbor. I had made the mistake of referring to it as a “petting zoo” at some point, which led to Amy being momentarily disappointed when she realized there wouldn’t be giraffes and such there. A mara or Patagonian cavy. These were in the barn, kind of tucked in behind the little store and away from where the more familiar animals – goats, pigs, etc. – were. They’re the second largest rodent species (after the capybara), a couple of feet long and up to 35 pounds or so. I’d never heard of them before. Some long-horned cattle in a field near the petting farm. I realized when I saw these on the way in that I had sort of noticed them on my previous Michigan trip, when I’d picked up a prescription at a medical facility on the vast Domino Farm sprawl, and meant to investigate but then forgotten. This shot is from the hayride. One of Amy’s little tricks at Kevin’s place was “wearing furniture” – the little armrest covers from the recliner. I’d also like to point out that the nightgown she’s wearing is from fabric she had picked out herself, sewn by Cindy. She loves it. (1.7MB AVI, 2.0MB WMV) One of my favorite home-movie segments that I remember from my childhood is of my cousin Pam – very young at the time – trying to blow out the candles on a birthday cake. This is kind of similar. (3.6MB AVI, 3.1MB WMV) Amy’s absolute favorite animal at the petting farm was this plain old black cat named Squirrel. We’re fortunate to have some forested conservation land pretty close to our house, and I often take Amy for walks there. There’s a log she really likes climbing over, and a “bridge” (actually a boardwalk) over some wet areas, but one of the best parts in the right season is what I call Ladyslipper Corner. Right now, for example, there are probably more than twenty pink ladyslippers all within about a twenty-five foot circle. Here’s one. …and here’s Amy with another. Amy and me outside a restaurant that had some nice flowers. A double rainbow over Niagara. The second one’s only faintly visible against the trees at about water level in the middle; it was more obvious in real life. I also think it’s cool the way the appearance of the water changes as you go from “inside” to “outside” the primary rainbow. Maid of the Mist. There are actually several boats with that name, plus numbers, and often two or three out there simultaneously. I have no idea which one this was. The handles are there for your safety. Please hold onto them for the duration of the ride. These are still from back in August. Slowly, I’m catching up. A rabbit that we found in the Nichols Arboretum in Ann Arbor. I apologize for the poor color and light; the little guy was in shadow and I didn’t want to startle him by using the flash. Same place, almost the same time, same hard-to-fix camera settings. Trying on one of my mother’s hats. Just hanging out with Grandma. Reading with Uncle Kevin (my brother, for those who don’t know).